If the pork belly came with skin, filet it off and save it for later. Then cut the belly into manageable pieces. Puree the garlic, peppercorn, thyme, bay leaf, kosher salt and curing salt in a food processor. Let it run until reduced to a paste. Then mix in a bowl with the honey (or syrup) and liquid smoke. Coat the meat and place it in plastic bags. Give the meat a thin and thorough coating of rub. Put the bags in the fridge for seven days. Be sure to rotate them each day to ensure that the rub will be evenly distributed. At the end of a week, wash the meat in cold water and then pat dry (if you put damp meat in the oven it will finish at the wrong consistency). Then let it sit for a half an hour or more at room temperature. 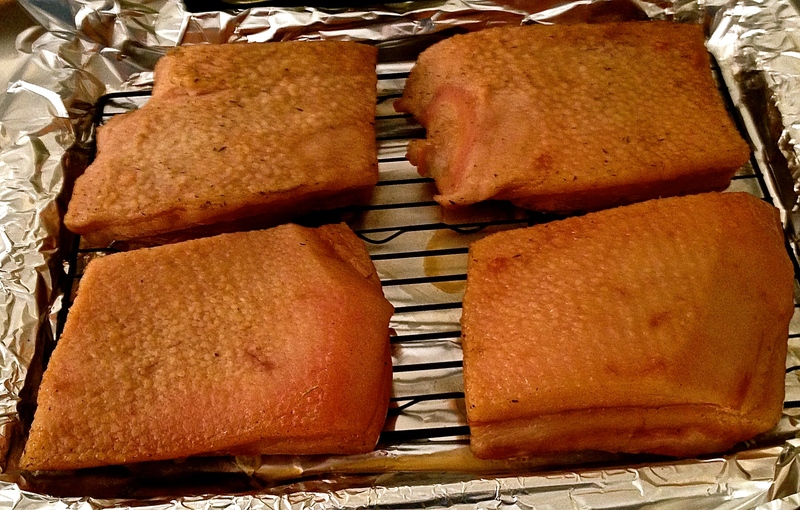 While the pork belly’s resting preheat the oven to 200°. Then put the meat in for 90 minutes. Do not turn it, touch it, or let it go for longer than 90 minutes***. After the pork’s out, let it rest for about half an hour. Then bag it and put it back in the fridge. I’ve heard that it can stay in the fridge for months, but have never kept it around long enough to find a time limit. * The cheapest bacon on sale at Giant is $6.00 a pound. See what I mean? When you go shopping look for product that has the skin on, because you can cook skin separately as cracklings. And crackling is amazingly good. ** Curing salt’s important because the nitrates in the salt will keep the pork fresh and pink, and the fat firm and white. So make the effort and get the curing salt. *** If you have a smoker, put it in for 2 hours at 250°, until the internal temperature reaches 160°. I really should try this sometime. Bill has actually a smoker which we hardly use. It really looked so yummy. I’d recommend using the liquid smoke instead. Some things really do better in a smoker, but the bacon is faster and easier when using liquid smoke. 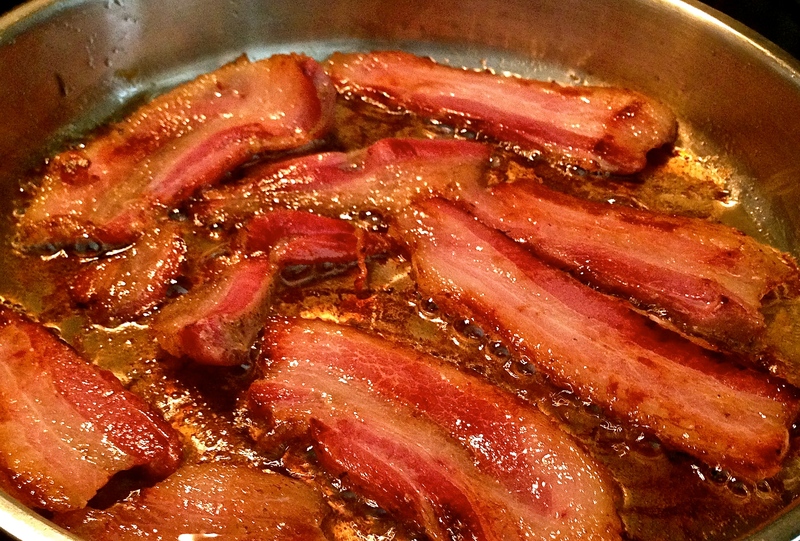 I also think it’s better from the oven because it’s easy to oversmoke bacon. Thanks for the feedback & let me know if you give it a try! 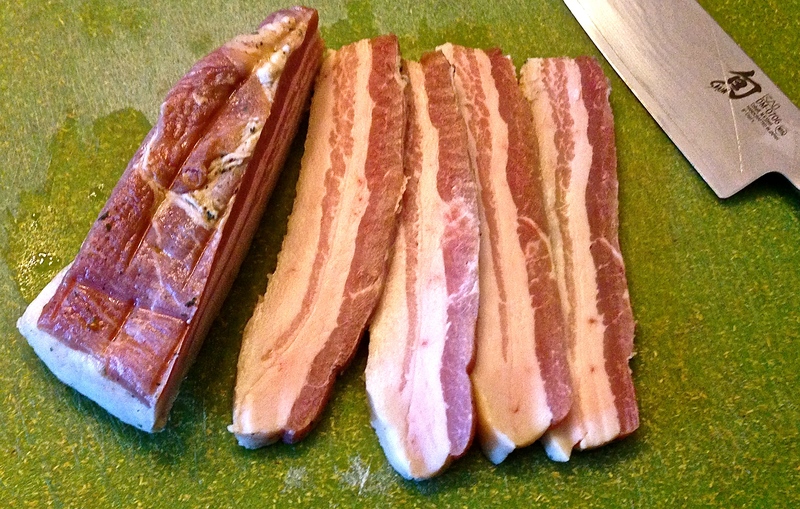 Eric, I tried your home cured bacon recipe and smoked it over hickory to a temperature of 160F. The pork belly came from Costco and it was very lean. 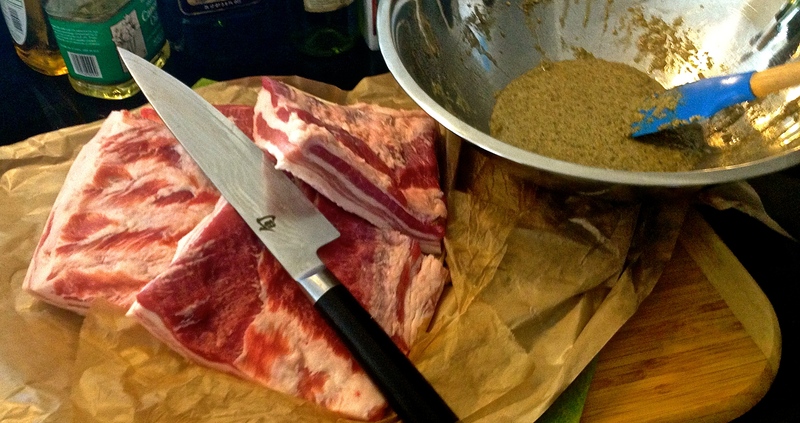 The final product was very smokey, salty and porky with a wonderful aroma of herbs and garlic. Since it cured while we were away on vacation, it didn’t get turned every day. To compensate, I cured it an additional 5 days on the other side… probably why it’s so salty. I consider it a great success and will try again. Thanks for the recipe. Glad it worked out Alan. Great picture on FB!